This course is composed of five core topic elements. It begins with a Webcast introducing forecasters to typical marine forecast customers and their wind and wave concerns. The goal of this course is to provide solid foundation knowledge of wind and wave processes with the aim of improving wind and wave forecasting skill and service to customers in the marine environment. 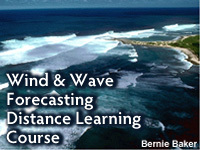 This self-paced course begins with a Webcast by Troy Nicolini in which he introduces forecasters to typical marine forecast customers and their particular wind and wave concerns. The second module discusses the basic traits of waves and how they change once they become swell. It serves as building block to the subsequent modules on wave generation, propagation, and dispersion. The Wave Life Cycle I: Generation module examines how wind creates waves and the inter-relationships between wind speed, wind duration, and fetch length. Following that module, Wave Life Cycle II: Propagation & Dispersion, teaches marine forecasters to manually predict how wave height and period change as waves leave their generation area, become swell, and then propagate and disperse into coastal waters. The final element of the course is a resource guide primarily intended for experienced forecasters that may be new to marine forecast responsibilities. The guide highlights differences between the marine boundary layer and terrestrial boundary layer winds. As described, this course organizes relevant materials on the MetEd Website into an organized learning path. By using our Registration & Assessment system, you can track your progress through the course and receive individual module certificates as well as a course completion certificate. Los cursos de MetEd comprenden una serie de lecciones relacionadas con un área temática particular. Cuando termine de estudiar todas las lecciones se le ofrecerá un certificado de finalización imprimible para el curso. Es obligatorio inscribirse en el sitio para acceder a nuestros cursos y lecciones. Encontrará más información sobre la inscripción y ayuda con las dudas más comunes sobre nuestro sitio en la página de respuestas a las preguntas más frecuentes.